Description: Standing upright on two legs is a complicated control problem for the nervous system. Humans never stand perfectly still and small muscular corrections are constantly made to keep the head and trunk in an upright posture. But sending the proper muscular commands is only half the problem. Proper corrections are possible only if you have a good estimate of body position. To get this estimate, you need information from the visual (eyes), vestibular (inner ear) and somatosensory (muscular and skin receptors) systems. We know a lot about how each of these sensory systems contribute to postural control, but very little is known about how sensory information from different senses is fused to form a estimate of body position. The primary trio of modalities that are crucial for flexible postural control are the visual, vestibular and proprioceptive systems. A primary goal of our research group has been to investigate the processes underlying the fusion of these modalities. We are simultaneously perturbing upright stance with all three modalities. To our knowledge, this has never been achieved experimentally. Our goal is to understand how visual, vestibular, and proprioceptive feedback are re-weighted so that overall feedback remains suited to stabilizing upright stance. 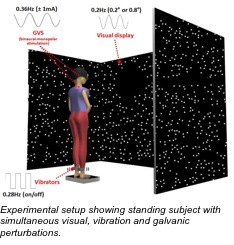 Creath R, Kiemel T, Horak F, Jeka JJ (2008) The role of vestibular and somatosensory systems in intersegmental control of upright stance. Journal of Vestibular Research 18(1), 39-49. Jeka JJ, Saffer M, Allison L, Zhang Y, Carver S, Kiemel T (2006) Sensory reweighting with translational visual stimuli in young and healthy elderly adults: The role of state dependent noise. Experimental Brain Research, 174 517-527.